Indian Bayou- Funeral Services will be held for Pervis. J. Abshire, 84, at 2:00 PM on Saturday, September 15, 2018 in the Duhon Funeral Home-Rayne Chapel with Rev. Jimmy Broussard officiating. Visitation will begin in the funeral home chapel on Friday, September 14, 2018 at 10:00 AM until 10:00 PM and will resume on Saturday at 8:00 AM until just prior to the service time. 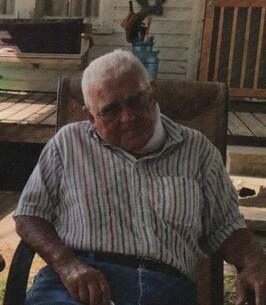 Interment will follow the chapel service and will be in Abshire Cemetery in Kaplan, LA. Mr. Abshire passed away on Wednesday, September 12, 2018 at his home in Indian Bayou, LA. Mr. Abshire is survived by his loving wife of 65 years, Gladys B. Abshire of Indian Bayou, LA; son, Jerry Abshire of Indian Bayou, LA; grandson, Jeremy Abshire and his wife, Amanda of Crowley, LA; great-granddaughter, Kennedy Abshire of Crowley, LA; sisters, Ethel Gesser of Galliano, LA, Dula Mae “Bea” Cable of Underwood, Indiana as well as numerous nieces and nephews. He was preceded in death by his parents, William and Enola Abshire; son, Shelton Abshire; grandson, Jacob Abshire; brothers, Doris Abshire and Hubert Abshire; sisters, Adia Hebert, Mildred Abshire and Helen LeMaire. You may view the obituary, sign the guest registry and express condolences online to Mr. Abshire’s family at www.duhonfuneralhome.com. Duhon Funeral Home, LLC- Rayne, (337) 334-3600, 900 East Texas Ave., Rayne, LA 70578 is in charge of all of the arrangements. Abshire Cemetery rd(Ward Rd). & Longleaf Rd. We encourage you to share any memorable photos or stories about Pervis. All tributes placed on and purchased through this memorial website will remain on in perpetuity for future generations.